ELF gives you the opportunity to create a kitchen designed to fit a specific room in your house, a kitchen that moulds itself to the available space. 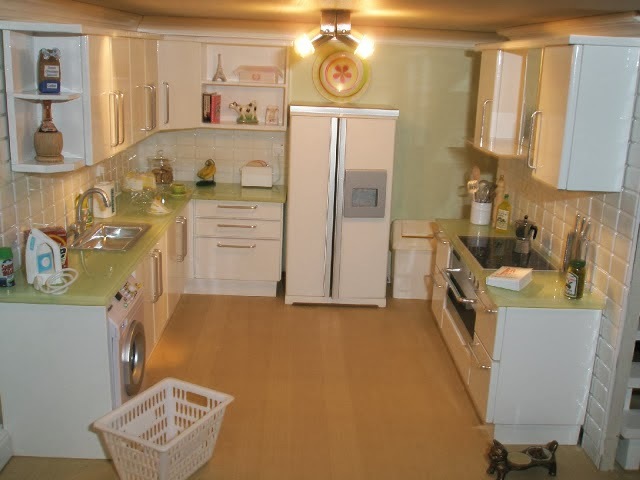 But what happens if you want to re-vamp the existing house and transfer the kitchen to a new house? Several years ago Joelle bought a ready-built kitchen from ELF and created this much admired room with the deep blue walls. The original kitchen when she purchased it didn't include the drawers to the left of the oven, but we were able to build those for her, with another wall unit above, giving a real focus to the cooking area. But recently she acquired a new, slightly bigger house, and wanted to move the kitchen to the new property. 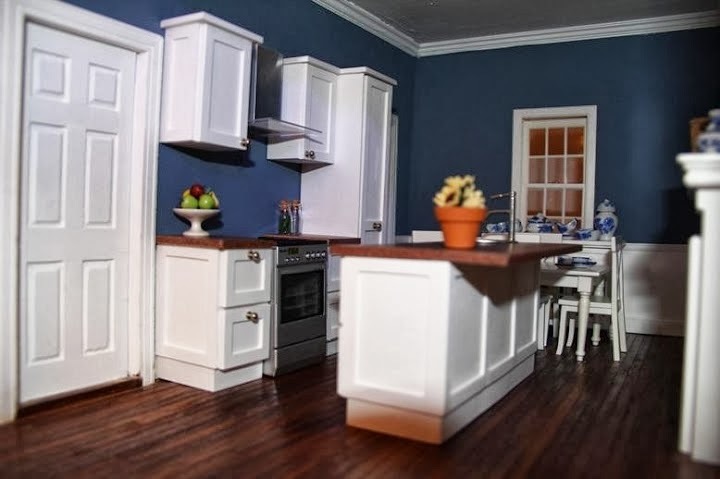 This time there are French doors on the left side, so she decided to move the oven to the right hand side, leaving her space to add a large American style fridge on the left. We built the original kitchen, but in the intervening time, Joelle has gained in confidence with her woodworking skills, and decided to make the new units herself, using our kits. She has added a housing for the fridge and the small units that mirror those on the other side of the doors. The "old" kitchen now has a brand new chic appeal. We built Heather's kitchen to suit her first house and the units are arranged on three sides, with the sink on the left, oven to the right and the fridge at the back. But a couple of years on, Heather too purchased a different house and decided to move her existing kitchen to the new one. As with Joelle, the new house was slightly bigger, so the units that had been on the right now found place against the longer back wall, and with all this extra space, Heather decided to add an island, which now becomes the focal point with the young couple enjoying a relaxing drink at the end of the day - we can see the raw ingredients on the chopping board ready to create supper for a cosy night in. But that was all a couple of years ago, and Heather decided the house needed a complete re-vamp, and to help with the project, she decided to sell her original kitchen. 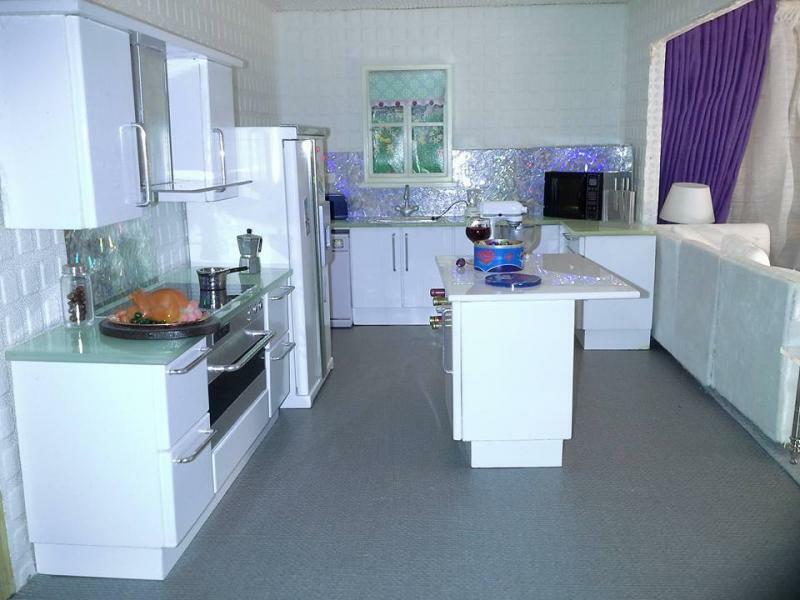 Doreen Patrick's son happened to see it, and decided to treat his mother to the ELF kitchen she'd long wanted. 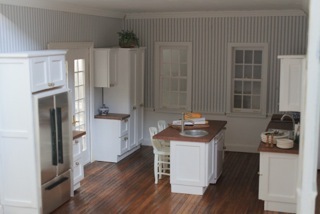 The sink is now on the back wall, and the oven on the left. The original wall units won't fit the back wall because of the window, but we can supply Doreen with two new made-to-order units that will fit the space perfectly and frame the window. So the kitchen has a whole new look and another life in a new home (and we love that sparkly splashback!). With thanks to Joelle S, Heather and Doreen Patrick for permission to use their photos.